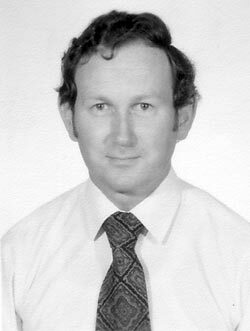 Roger Cordt Meyer was born in October 1942 and joined DCA on 3 February 1960 as a Radio Technician-in-Training. There were eight trainees in the intake, of whom six completed the five-year apprenticeship. 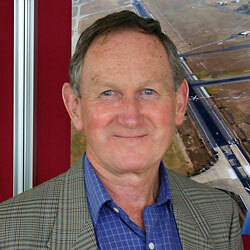 After qualifying, Roger was appointed to the Radio Installation Section (located in Second Avenue, on the western side of Essendon Airport). His first task was the installation of the new Route Surveillance Radar (RSR) and Area Approach Control Centre (AACC) at Melbourne Airport. After a few months of this work, he was asked to go to Regional Office (123 Latrobe Street) to assist the Engineers by designing radio circuits and undertaking small-scale installation projects. Roger discovered an aptitude for design work and project management, and this progressed to undertaking larger scale projects, which ultimately included Control Towers, radar operator consoles, communications equipment, search and rescue centres, training simulators, and a many, many smaller scale projects. In this capacity, Roger worked closely with air traffic controllers in the writing of Facility Schedules (operational documents which stipulated additions and changes to ATC facilities, with engineering concurrence). In 1974, Roger heard of the Head Office decision to formally establish a collection of redundant radio and ATC equipment as the foundation of a Museum. They were seeking a Custodian, and Roger offered his services. When Head Office relocated to Canberra in the early 1980s, the key H.O. people involved with the Museum retired (Ron Rye, George Brown and Eric Anderson), and by default the Museum became the responsibility of the Victoria/Tasmania Region. It survived several cost-cutting purges and, by constantly scrounging funds, and by the goodwill of field staff at Essendon Airport, the museum survived. Roger was allocated 5% of his working time to manage the Airways Museum. In 1982, the Department of Transport announced that an Historical Society was to be formed, to connect the great amount of historical interest from the public with the wealth of historical knowledge within the Department. Each Region was asked to appoint a volunteer to set up a local Division. Roger offered, and was soon appointed as Secretary of the Victoria/Tasmania Division. Divisions in SA/NT, WA and the ACT were also established, but never in NSW or Queensland. In time, the ACT Division folded, and the Vic/Tas Division (by default) took over responsibility for Tasmania, Victoria, NSW and Queensland. The Civil Aviation Historical Society (CAHS) battled on through the 1980s, during which time the Harper Lectures, the Johnston Lectures and the DCA 50th anniversary were among the highlights. In June 1999, the Historical Society moved its base from the city to Essendon Airport where it is now co-sited with the Airways Museum. Since then, the Society has grown in stature and outreach. Click here to see a photo of Roger with some of our distinguished guests. Roger Meyer retired on 6 October, 1999, as a Middle Manager (Technical Specialist) after 39½ years service. Roger was also Secretary of the CAHS from 1983-1999 and has been President since then. Roger Meyer was awarded a well-deserved Medal of the Order of Australia (OAM) in the 2006 Queen's Birthday Honours "for service to the community through the preservation and recording of Australian civil aviation history". 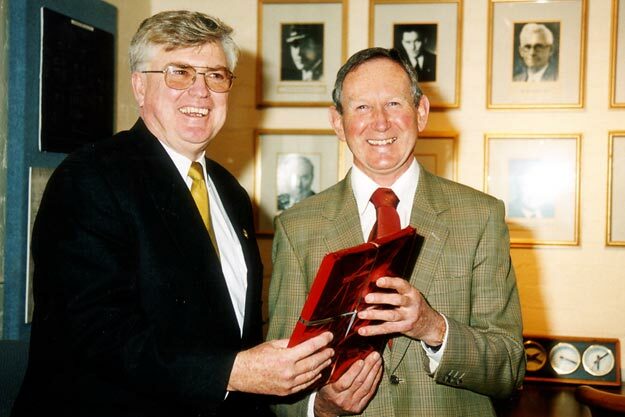 Above: Airservices Australia Chief Executive Bernie Smith hands CAHS President Roger Meyer the first formal contract for the CAHS to operate the Airways Museum on behalf of Airservices Australia, 2001.